harlie Rich, also known as "The Silver Fox," waited 39 years to have a number one record. But with all the ups and downs in his checkered life and career, it sometimes seemed more like a hundred. Born December 14, 1932 in Colt, Arkansas, Charlie developed an early love of blues and gospel singing as well as jazz piano. In the early '50s, the farmer's son served with the Air Force in Oklahoma, while moonlighting with a group called the Velvetones (featuring his wife Margaret Ann on vocals). After his discharge, Rich returned to Arkansas and worked the farm with his father. "I wanted some security for my family," he explained to Robert Hilburn of the Los Angeles Times in 1974. "We had two kids and one on the way. I was still into music to some degree. If I had time, I'd play a gig around Memphis for $10 or $20 a night. "After I had the family, however, I didn't see how I could make a living in the music. There was always the idea in the back of my mind that if I could work it out, it would be nice, but the idea of making enough money though music seemed so remote." It all began to work out when Margaret Ann sent a tape of her husband's songs to saxophonist Bill Justis. 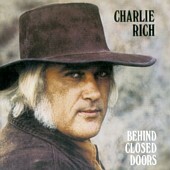 "The Most Beautiful Girl" was an even bigger smash than the title track from Charlie's Rich's album Behind Closed Doors. Released in April 1973, Behind Closed Doors peaked at #8 on the Billboard Hot 200, remaining on the charts for an impressive 105 weeks. It was certified gold by the R.I.A.A. in Nov. 1973 and certified platinum in Nov. 1986. Justis, who had a number two hit with "Raunchy" in December, 1957, introduced Charlie to Sam Phillips of Sun Records in Memphis. Phillips recognized Charlie's talent, but told him to take some Jerry Lee Lewis records and come back when he'd learned how to rock. He was a good student, scoring in May, 1960, with a number 22 hit -- the rockabilly classic "Lonely Weekends." When Sun closed shop in the early '60s, Rich recorded briefly for RCA's Groove subsidiary. Then he signed with Mercury's Smash label in 1965, recording his second pop hit, "Mohair Sam" (number 21). An album for Hi Records took Charlie toward a more country-ballad format. The transition from rockabilly singer to country crooner was complete when he joined the Epic stable in the late '60s. Working with Nashville producer Billy Sherrill, he recorded one of the most heart-wrenching working class laments in country music, "Life Has Its Little Ups and Downs." It is a title that reflected Charlie's career. The "ups" started in 1973 with "Behind Closed Doors," a single that went to number 15 on the Billboard Hot 100. His crossover success continued with "The Most Beautiful Girl," which cemented Charlie's position as a mass appeal, mainstream star. The record debuted on the Hot 100 at number 83 on September 29, 1973, and reached the summit 11 weeks later. During the next two years, Rich continued hitting the pop chart with country-flavored hits like "There Won't Be Anymore" (#18), "A Very Special Love Song" (#11) and "Ever Time You Touch Me (I Get High)" (#19). But the "downs" were still to come, including a drinking problem and an inability to deal with stardom, all documented in Peter Guralnick's essay on Rich in his book Feel Like Going Home. Guralnick nevertheless wrote of Charlie in glowing terms: "He is a musician of extraordinary eclecticism, someone in whom a variety of musical elements have fused to create an artist who functions with all the necessity of a country or blues performer but with considerably greater complexity. He has a voice of remarkable range and feeling which he uses to great emotional effect. The material he does is very much his own personal brand of soul, encompassing almost the entire spectrum of American popular music." After moving to Elektra in 1979, Charlie remained moderately popular as a country mainstay, but he was unable to duplicate his staggering mid-'70s pop success. An album for Sire in 1992, which included covers of Duke Ellington's "Mood Indigo" and the gospel standard "I Feel Like Going Home," further demonstrated his eclecticism. In 1995 while en route to Florida with his wife, Charlie died in Hammond, Louisiana, of a blot clot in the lungs. - Fred Bronson, The Billboard Book of Number One Hits, Billboard, 1988.